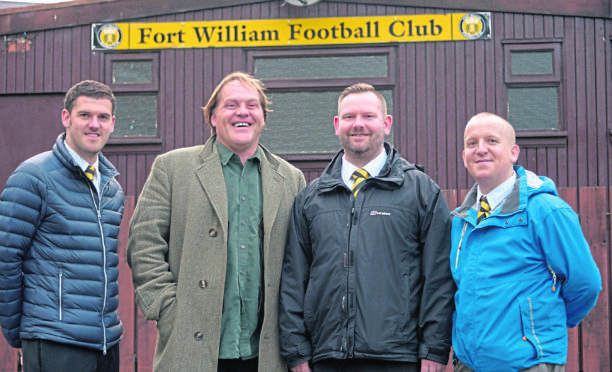 Fort FC directors (left - right) John Bamber, Woody Wood, Michael MacKinnon and Sam Lees. As the challenges facing Fort William have intensified in recent weeks, the determination to revive the Lochaber club’s fortunes has only increased. Fort faced uncertainty towards the end of last season when all six board members stepped down, with the club considering switching to the North Caledonian League. The incoming trio of directors – Colin Wood, Samuel Lees and William Edwards – made clear their intention to keep Highland League football at Claggan Park, an outcome which was confirmed prior to the handover of the club in June. The new era generated fresh enthusiasm but it has been far from plain sailing. Saturday’s 11-0 defeat by Cove Rangers is the sixth double-figures loss for Kris Anderson’s side. The fielding of an ineligible player has seen the club hit by a nine-point deduction and £150 fine by the league, while Fort will this month lose secretary Marie McMillan and treasurer Alex MacNab when the long-serving duo step down from their roles. A meeting on Sunday will aim to replace those vital roles, which can help in running this charming club whose ground is tucked into the foothills of Ben Nevis. Among those to get involved at committee level during the summer is Michael MacKinnon, a worker at the town’s aluminium factory. Never once did he envisage this would be easy but, despite all that has elapsed, MacKinnon highlights progress lost amid the on-field struggles. He said: “We were struggling to get a manager in. It took about five weeks. “We were late on the go and five guys showed up to our first pre-season session. “Everyone sees we are getting beaten 11-1 or 10-0 but, to us, we are winning. It would be really easy to get disheartened and say it is not worth it. But it is. The club has faced a long-running challenge to compete with shinty, which is the dominant sport in Lochaber. While that is unlikely to change, MacKinnon has long-term designs on helping football’s cause. The 36-year-old added: “There’s an attitude where Fort William Football Club is always last and it’s a bit of a joke. “We need to get people back interested in year one. Given the challenges already faced in the space of three months, you could be forgiven for thinking Wood has had second thoughts about getting involved? Think again. “If we had stopped and finished at any point, all we would have left is regret. It has just made us stronger,” he added. A long road lies ahead but Fort William undoubtedly have the heart to make the journey.